Fundamentals in the economy and capital markets continue to move in a positive direction and, at near 15x forward earnings, equities appear reasonably priced compared to Treasuries. Still, the changing dynamics of global growth, employment, and inflation are keeping markets attention. This week, politics will move to center stage as Americans go to the polls to cast their votes in midterm elections. Polling ahead of the midterms seems to favor Republicans given President Obama’s 40% approval rating and a historic bias against incumbents during midterm races. Republicans are looking to pick up six net seats in the Senate to attain a majority while the Republican-controlled House of Representatives is also likely to see a net pickup in Republican-controlled seats, according to most polls. While the discourse and dynamics on some issues in Washington could change based on the outcome, it is hard to imagine much change in the stalemate that has emerged between the administration and lawmakers. Control of the House and Senate by Republicans could be viewed by markets as a positive for banks, oil, and defense contractors while a surprise victory by Democrats would likely favor healthcare and alternative energy plays. A Republican sponsored tax package or efforts to roll back regulatory reform measures like Dodd-Frank could be forthcoming if both the House and Senate come under Republican control. Still, such measures would need to pass President Obama’s desk for his signature. Away from the political stage in Washington, investors continue to focus on central banks. Last week, the Bank of Japan (BOJ) sent global equity markets higher along with the U.S. dollar with the surprise announcement of additional stimulus. The announcement pushed the U.S. dollar higher along with risk assets. Both the S&P 500 and the Dow closed Friday at records on the BOJ news. In response to weakening growth, the Bank of Japan said it will increase purchases of government bonds between $90 billion and $180 billion dollars (10 to 20 trillion yen) to $725 billion annually (80 trillion yen). At the same time, Japan’s welfare ministry unveiled a plan to raise the equity allocation of the pension’s $1.2 trillion investment portfolio. The move was controversial and the Bank of Japan vote was divided (5-4 in favor), but the size of Japan’s purchases will drive the BOJ balance sheet quickly to 60% of Japan’s GDP (2-3 times higher than the United States and Europe’s ratios, respectively). 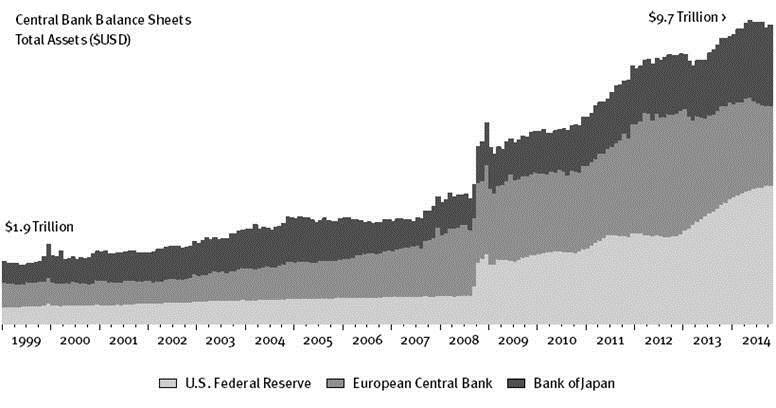 Total assets on the books of the Fed, ECB and BOJ now are near $9.7 trillion (chart below) reflecting the dramatic actions by central banks in recent years to thwart deflation. By dramatically increasing the size of asset purchases, the Bank of Japan is also demonstrating a willingness to do whatever it takes to eradicate a deeply entrenched deflationary mindset. In our view, these asset purchases are designed to offset global deflationary pressure that is resulting from a large buildup of debts in the system. Data from the Bank of International Settlements shows that total outstanding debt globally issued by governments, financial institutions, and non-financial institutions now stands at $91 trillion, far in excess of $75 trillion of global GDP (chart bottom). The pace of aggregate debt has now slowed even including the record surge in government borrowing that occurred since the recession. The net result of slower total debt growth has been slower growth in credit and an increased tendency toward deflation. The move by the Bank of Japan, like the other rounds of central bank asset purchases that came before, is another in an increasingly common and regular set of moves by central banks in an effort to avoid deflation and attain positive inflation targets. Our view has been (and remains) that growth in the economy and earnings ultimately drives stock prices. Therefore, we continue to monitor our WCA Fundamental Conditions Index for changes in the economy that could affect growth and supports a continued tactical overweight in the dollar and U.S. equities in our view. That index continues to point toward continued growth. Secondly, we continue to monitor valuations for signs of excesses of optimism or pessimism. On this measure, we are encouraged by continued growth in earnings of S&P 500 companies where S&P 500 earnings per share are tracking toward over 7% growth this quarter. On a forward 12-month basis, the S&P 500 is expected to earn $128.53 according to analysts surveyed by FactSet. Using Friday’s closing price for the S&P 500, the multiple of expected earnings now stands near 15.7 — 11% above the 10-year average multiple (14.1 times). In short, the bull case is strengthened by continued signs of growth in the economy and earnings, but somewhat tempered by the fact that valuations are mildly stretched at this time. Still, given today’s price, expected earnings, and a sub-3% 10-year Treasury yield, it is hard to conclude that the market is significantly overvalued. Positive fundamentals and continued growth and somewhat reasonable valuations are not a bad backdrop for equities.